Cutaneous aspergillosis is usually a cutaneous manifestation of disseminated infection with the fungus Aspergillus. Primary cutaneous disease is rare and is most commonly caused by Aspergillus fumigatus and Aspergillus flavus. Rare cutaneous infections have been reported with Aspergillus terreus and Aspergillus ustus. Colonization of burn eschars by Aspergillus is common, and reports have described primary cutaneous infection in immunocompetent patients in association with agricultural trauma. Usually, however, aspergillosis begins as a pulmonary infection subsequent to inhalation of fungal spores. In the immunocompromised host, hematogenous dissemination and invasion of other organ systems, including the skin, often follows the initial pulmonary infection. Dermatologic manifestations of disseminated aspergillosis include single or multiple erythematous-to-violaceous plaques or papules, often characterized by a central necrotic ulcer or eschar. 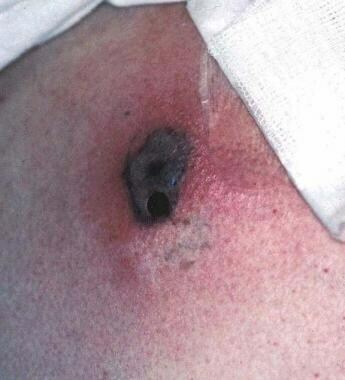 Skin lesions occur in 5-10% of patients with disseminated aspergillosis. In primary cutaneous aspergillosis, the most typical presentation is implantation of the fungus following trauma, including infections at the site of intravenous cannulas, or venipuncture wounds, especially those that have been covered with occlusive dressings. Note the image below. Aspergillus is a frequent contaminant found in cultures of dystrophic nails, but it can occasionally cause a true onychomycosis. Primary cutaneous aspergillosis at a site of an intravenous catheter in a boy with leukemia. Some environmental risk factors have also been implicated in cutaneous aspergillosis; these factors include construction sites and contaminated ventilation systems, presumably caused by effects on spore distribution. Aspergillosis is the second most common opportunistic fungal infection in patients who are immunocompromised, accounting for as many as 20% of fungal infections in patients who have received bone marrow or solid organ transplants. Key risk factors for cutaneous aspergillosis include neutropenia from hematologic malignancy or chemotherapy, immunosuppressive therapy, AIDS, diabetes, tissue damage, allogenic hematopoietic stem cell transplant, and cytomegalovirus infection. No clear sexual predilection is reported for cutaneous aspergillosis. Neonates occasionally develop disseminated aspergillosis, presumably because of their immature immune mechanisms. When cutaneous aspergillosis occurs in the setting of systemic aspergillosis, the prognosis is poor. Disseminated aspergillosis is associated with a mortality rate of greater than 90%. In contrast, multiple case reports have documented resolution of primary cutaneous aspergillosis after surgical excision followed by, in some cases, systemic antifungal therapy. Ozer B, Kalaci A, Duran N, Dogramaci Y, Yanat AN. Cutaneous infection caused by Aspergillus terreus. J Med Microbiol. 2009 Jul. 58:968-70. [Medline]. Zhang QQ, Li L, Zhu M, Zhang CY, Wang JJ. Primary cutaneous aspergillosis due to Aspergillus flavus: a case report. Chin Med J (Engl). 2005 Feb 5. 118(3):255-7. [Medline]. Mohapatra S, Xess I, Swetha JV, et al. Primary cutaneous aspergillosis due to Aspergillus niger in an immunocompetent patient. Indian J Med Microbiol. 2009 Oct-Dec. 27(4):367-70. [Medline]. van Burik JA, Colven R, Spach DH. Cutaneous aspergillosis. J Clin Microbiol. 1998 Nov. 36 (11):3115-21. [Medline]. Liu X, Yang J, Ma W. Primary cutaneous aspergillosis caused by Aspergillus.fumigatus in an immunocompetent patient: A case report. Medicine (Baltimore). 2017 Dec. 96 (48):e8916. [Medline]. Kartik M, Kanala A, Sunilnadikuda, Rao SM, Prakasham PS. Invasive Mediastinal Aspergillosis in Immunocompetent Male with Invasion of Left Atrium and Hilar Structures. Indian J Crit Care Med. 2017 Jun. 21 (6):408-411. [Medline]. Kim CW, Seo JS, Kim MK, Jun EJ, Choi JC, Choi BW. Secondary cutaneous aspergillosis disseminated from the lungs of a patient with asthma on 1 month steroid treatment. Diagn Microbiol Infect Dis. 2010 Jan. 66(1):104-7. [Medline]. Larkin JA, Greene JN, Sandin RL, Houston SH. Primary cutaneous aspergillosis: case report and review of the literature. Infect Control Hosp Epidemiol. 1996 Jun. 17(6):365-6. [Medline]. Robinson A, Fien S, Grassi MA. Nonhealing scalp wound infected with Aspergillus niger in an elderly patient. Cutis. 2011 Apr. 87(4):197-200. [Medline]. Naidu J, Singh SM. Aspergillus chevalieri (Mangin) Thom and Church: a new opportunistic pathogen of human cutaneous aspergillosis. Mycoses. 1994 Jul-Aug. 37(7-8):271-4. [Medline]. Boch T, Reinwald M, Postina P, Cornely OA, Vehreschild JJ, Heußel CP, et al. Identification of invasive fungal diseases in immunocompromised patients by combining an Aspergillus specific PCR with a multifungal DNA-microarray from primary clinical samples. Mycoses. 2015 Dec. 58 (12):735-45. [Medline]. [Full Text]. Zhang S, Wang S, Wan Z, Que C, Li R, Yu J. Quantitative Real-Time PCR and Platelia Galactomannan Assay for the Diagnosis of Invasive Pulmonary Aspergillosis: Bronchoalveolar Lavage Fluid Performs Better Than Serum in Non-neutropaenic Patients. Mycopathologia. 2016 Jun 7. [Medline]. Krishnan-Natesan S, Chandrasekar PH, Manavathu EK, Revankar SG. Successful treatment of primary cutaneous Aspergillus ustus infection with surgical debridement and a combination of voriconazole and terbinafine. Diagn Microbiol Infect Dis. 2008 Dec. 62(4):443-6. [Medline]. Cooke FJ, Terpos E, Boyle J, Rahemtulla A, Rogers TR. Disseminated Aspergillus terreus infection arising from cutaneous inoculation treated with caspofungin. Clin Microbiol Infect. 2003 Dec. 9(12):1238-41. [Medline]. Koss T, Bagheri B, Zeana C, Romagnoli MF, Grossman ME. Amphotericin B-resistant Aspergillus flavus infection successfully treated with caspofungin, a novel antifungal agent. J Am Acad Dermatol. 2002 Jun. 46(6):945-7. [Medline]. Klein KC, Blackwood RA. Topical voriconazole solution for cutaneous aspergillosis in a pediatric patient after bone marrow transplant. Pediatrics. 2006 Aug. 118(2):e506-8. [Medline]. Noguchi H, Hiruma M, Matsumoto T, Kano R, Ihn H. Ungual aspergillosis successfully treated with topical efinaconazole. J Dermatol. 2016 Aug 11. [Medline]. Cabral C, Francisco V, Cavaleiro C, et al. Essential Oil of Juniperus communis subsp. alpina (Suter) Celak Needles: Chemical Composition, Antifungal Activity and Cytotoxicity. Phytother Res. 2012 Feb 1. [Medline]. Walsh TJ, Raad I, Patterson TF, et al. Treatment of invasive aspergillosis with posaconazole in patients who are refractory to or intolerant of conventional therapy: an externally controlled trial. Clin Infect Dis. 2007 Jan 1. 44(1):2-12. [Medline]. Disclosure: Received consulting fee from Temptu for consulting; Received honoraria from Galderma for consulting; Received honoraria from SkinMedica for consulting.